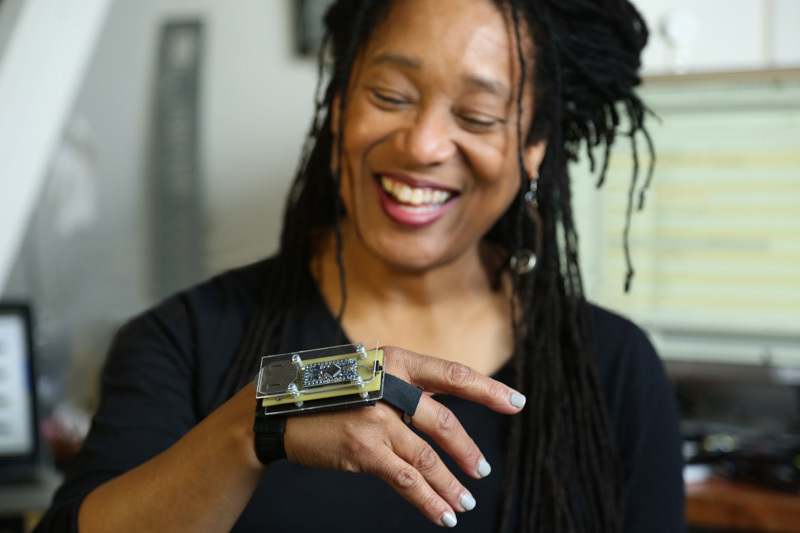 The 2018-19 season of Musical Ecologies continues Thursday, February 28 with San Francisco-based composer/performer Pamela Z. Well-known for her mixed-media solo performances that incorporate voice, electronics, video, found objects and midi-based gesture controllers, Z will perform a selection of short works and excerpts from her extensive solo repertoire, using processing on her voice, and manipulating live and sampled sounds with her gestures. The evening will begin with a “Composers Interviewing Composers” conversation hosted by series curator Dan Joseph. Composers Interviewing Composers is sponsored by Composers Now, and this evening’s event is part of the 2019 Composers Now Festival which celebrates living composers, the diversity of their voices, and the significance of their musical contributions to our society. During the month of February, the Festival brings together myriad performances ranging in genre from jazz to indie, classical to post-classical, experimental to folk, and beyond. Composers will be in attendance at all events. Composers Now is a project partner of The Fund for the City of New York. Now it its sixth season, Musical Ecologies is a monthly symposium on music and sound held at the Old Stone House in Park Slope, Brooklyn. Curated and hosted by composer Dan Joseph, each event typically focuses on a single artist who presents a work or project either in the form of a talk or lecture, a multimedia presentation, a performance, or combination thereof. Each presentation is preceded by an extended conversation between the artist and curator. Pamela Z is a composer/performer and media artist who works with voice, live electronic processing, sampled sounds, and video. A pioneer of live digital looping techniques, she creates solo works integrating experimental extended voice, operatic bel canto, found objects, text, digital processing, and MIDI controllers that allow her to manipulate sound with physical gestures. In addition to her performance work, she has an increasing body of installation work including sound works and objects with embedded interactive sound and video. She has composed and recorded commissioned scores for dance, theatre, film, and new music chamber ensembles including Kronos Quartet, New York’s Bang on a Can All-stars, Ethel (the NY-based string quartet), St Luke’s Chamber Orchestra, choreographer Brenda Way of ODC Dance, and experimental filmmaker Barbara Hammer. Her large-scale multi-media works have been presented at venues including Theater Artaud and ODC in San Francisco, The Kitchen in New York, and REDCAT in Los Angeles, and her media installation works have been presented in exhibitions at the Whitney Museum (NY), the Diözesanmuseum (Cologne), and the Krannert Art Museum (IL). She is the recipient of numerous awards including a Doris Duke Artist Impact Award, a Guggenheim Fellowship, the Creative Capital Fund, the CalArts Alpert Award in the Arts, The MAP Fund, the ASCAP Music Award, an Ars Electronica honorable mention, and the NEA and Japan/US Friendship Commission Fellowship. Comments closed — Trackbacks closed RSS 2.0 feed for these comments This entry (permalink) was posted on Monday, January 21, 2019, at 5:11 pm by Dan Joseph. Filed in press release.